PORTLAND, OREGON -- Among a throng of history-making performances on Saturday at Nike Cross Nationals, the girls title race signified, on some small level, a changing of the guard. 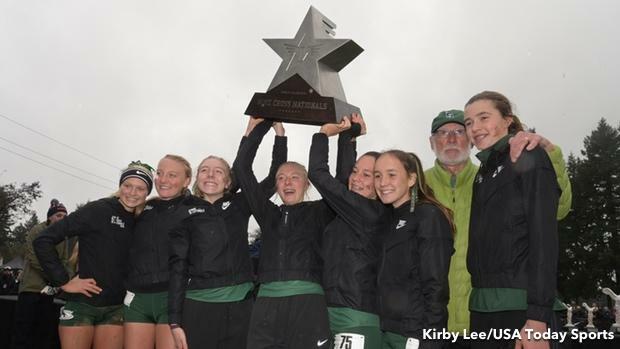 Because for the first time since 2013, and for just for the second time in 13 seasons, a team other than Fayetteville-Manlius (NY) High School won the overall girls title. And no doubt that surge came in the final mile, as the Bend Summit (OR) High School girls -- otherwise known as Central Oregon -- covered the field when it counted the most, producing a history-making win with 120 points. Naperville North was second with 186 points, while the Wayzata (MN) High School girls, who were the last team to beat FM at NXN back in 2013, reached the podium yet again in third-place with 207 points. In truth, this didn't come as a total surprise, considering Summit was ranked No. 2 in the country leading into the race and at one point owned the No. 1 ranking. But if we look back just a few years ago, there were factors that led to this turnaround. "It's definitely a bit of our come-up story," said junior Fiona Max, who led the team with an 11th-place finish. Two years ago, the Storm, comprised of a completely different varsity roster, finished dead last at NXN. Last year, this team didn't even make the field, failing to get an at-large bid after finishing third at NXR Northwest. But those slights weren't forgotten. "We knew regionals for us a year ago was a fluke," Max said. "We wanted to come back with full plans to get up there and show them who we actually were and where we belonged." Saturday's race didn't start easy, though. Positioned in box 8, the team had to navigate a muddy and puddle-ridden line. Junior Kelsey Gripekoven, who finished 67th, said she was dead last after the gun went off. "We had to deal with some puddles, but we jumped right through them," junior Isabel Max, who finished 77th, countered. Looking back to two Fridays before, the team believed a key pre-race workout came in Bend. "It was raining really hard and it was muddy," junior Azza Borovicka Swanson said. "It was the perfect training we could have hoped for." That planning, at least mentally, helped strengthen this team at the line, and then even more so when the race was just stretching out in the initial stages. After a mile, the girls weren't even in the top three. That honor, not surprisingly, went to a motivated Fayetteville-Manlius girls team, which finished fourth overall and led at the mile with 311 points. But the girls knew the real race began at the 3K mark, and that's when most started to pick off runners. Freshman Teaghan Knox, a bit shy in person but dangerous on grass, helped buoy Fiona's top 15 finish by coming through the chute in 42nd-place. In any other race at any other stage in the season, it would have easily dismayed a team to see the bulk of its scorers come through so late in the race. But this was NXN, and in a deeply competitive field, team places were often shadowed by individual runners. Summit scored its back three runners in 67th, 77th and 96th, though those performances were more than enough and granted the team its first national title. "When we got here we decided on something," Fiona Max said. "We're still going to come away from this happy and we wanted to come away satisfied. And we wanted to finish on empty. When we got on the line, we knew that even though we were in different places, we'd be running together and running for each other." Better yet, every runner on Summit's national title winning team returns for next year. Every runner needs internal motivation to help drive them forward. And while Katelyn Tuohy is the most prolific and accomplished high school runner since Mary Cain, she is no different. The North Rockland (NY) High School junior truly believed the top runners at Nike Cross Nationals were intent on challenging her Saturday. "After winning last year, I was definitely the one everyone wanted to beat," she said. "A lot of people hyped it up, but I knew not to focus on that and just to focus on my race." Tuohy set another course record at Glendoveer Golf Course on Saturday in 16:37.8, roughly a seven second improvement from her win last year. But perhaps she was at least on to something. 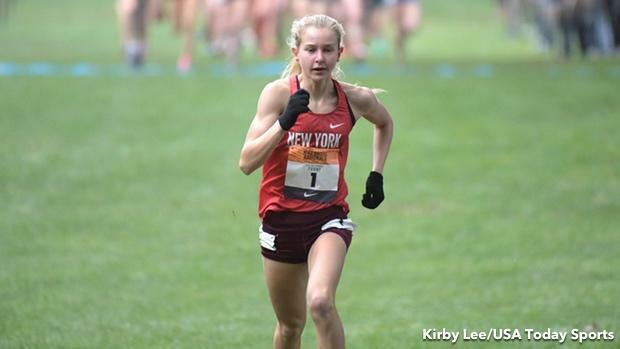 Saratoga Springs (NY) High School senior Kelsey Chmiel continued her nonstop improvement at NXN, running the fourth fastest time on the course all-time and becoming just the sixth girl to break 17 minutes. Chmiel finished second for the second straight year in 16:54.8. And in a smart race that saw her make a massive move at the 3K mark, the North Carolina State signee was never challenged from that point forward. "It's always a risk, but you have to stick with it once you make the move," Chmiel said. Beavercreek (OH) High School junior Taylor Ewert was third in 17:06.7, Minneapolis Washburn (MN) senior Emily Covert was fourth in 17:10.2 and Fayetteville-Manlius junior Claire Walters was fifth in 17:13.3. Tuohy took over just seconds into the race. She had done so many times over the last two seasons, and she had looked unstoppable this fall at Goddard Park East in Rhode Island and Sunken Meadows in New York, but this was nationals. She went out to an approximately 5:03 first mile, a little ahead of where she envisioned that first stage going. "I definitely knew I wanted to get out fast and establish my position," she said. "I was thinking everyone would go out with me in the first mile. It was almost 5 minutes, it was like 5:03. I went out too fast and paid for it in the end." Not too much, though. About the only time Tuohy looked the least bit concerned was with about 1K to go. She looked behind her shoulder at the 12:30 mark and saw Chmiel not too far off. But at that point, she was almost home. Later, she sprinted to the line in the final 200m stretch, in between a sea of fans. "I definitely know this course pretty well, this being my fourth time," she said. "Every year it's a great experience again." Tuohy said afterward she would take some time off, then prepare for the indoor season, where in January she will race at a professional field at The Armory. Later in February, the North Rockland girls will line up hoping to nail a fast distance medley relay at The Va Showcase.